A police officer's quick reactions helped him avoid what could have been a fatal crash as a car loses control and heads for the law official. 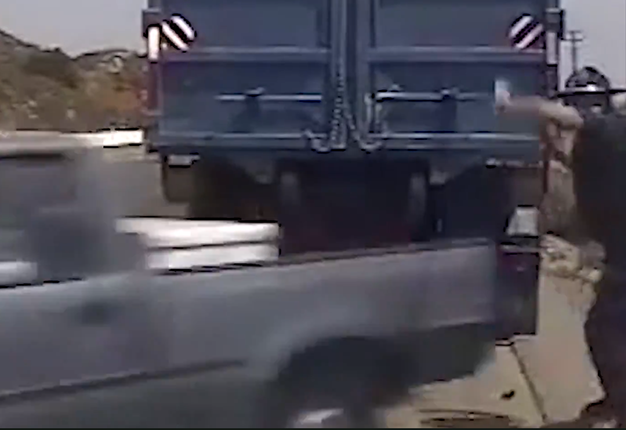 As the video shows, the officer signalled a truck to pull alongside the road. Moments later an unidentified vehicle nearly collides with him. Fortunately, the officer heard the screech of the tyres and managed to get out of the way just in time. WATCH: This road-sign crew should go back to 'school' for botched pedestrian crossing. A road contractor in Florida might need to brush up on spelling and grammar as they botched a the road signage for a pedestrian crossing. Some concept cars look to models from years past as an inspiration; here are some notable examples.